Not exactly. Maybe. OK, yes. No. That’s not fair. This is a book about the Holy Trinity of preserving, namely fermenting, pickling and drying. Three related but very, very different processes. Kool kids do indeed love kimchi. And rightly so. Yes, it’s fashionable right now to ferment anything that doesn’t move fast enough, but there’s good reason for that, because a lot of fermented or otherwise preserved food is both delicious and versatile, so maybe the Kool Kids are onto something here. It’s one of the oldest ideas known to humanity, and these methods of food preservation were essential before the modern advent of the refrigerator, and we used to be really, really good at it, because we had to be. Much of that knowledge remains in a huge range of world food traditions, and has been quietly continued and practiced over the centuries. It’s hard to say that something like the art of preserving food is a fad, because it never really went away. Some fads are fads because of a weird combination of circumstances that means that a small number of trend setters have decided that, right now, this is the business. Others are much, much more organic and grow out of something that’s suddenly rediscovered, a lost cultural reference point. 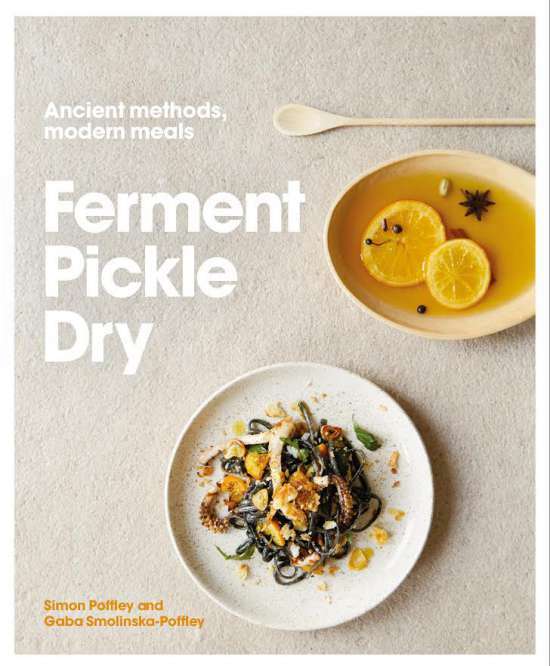 So, if you accept that preserving in whatever form is very ‘now’, then Ferment, Pickle, Dry by Simon Poffley and Gaba Smolinska-Poffley might very well be the book for you. There have been several books out recently on the art of fermentation or preserving of various kinds, but I’d say this is the pick of the crop. It’s a very beautiful thing, a small, stout hardback with modern typography and design, minimalist photographs illustrating the food. Think small white bowls of sauerkraut set against vast backdrops of pale grey. This isn’t style over substance. Yes, it’s stylish, and yes, it’s achingly modern, but the content is timeless, a range of classic preserving methods and recipes presented in a simple, unpretentious, straightforward way. The very first recipe seems almost comical in its simplicity – plain yoghurt, which boils down to adding some shop-bought yoghurt to some milk and waiting, but it sets the tone and signposts what’s to come. Many of these recipes require little more than the careful selection and combination of ingredients followed by a period of waiting, waiting during which nature does it’s thing, either by evaporating the moisture content, growing it’s particular strains of ‘good’ bacteria, or just killing everything bad in sight with acidity. Time is the real killer ingredient. Yes. Preserving is very easy, and there’s little in this book that should put anybody with an interest in exploring this topic off. Simon Poffley and Gaba Smolinska-Poffley describe the processes and methods with clarity and simplicity, and their recipes clearly succeed in being both accessible and authentic. Ferment, Pickle, Dry is a great place to start.